Rub salmon lightly with olive oil and season with salt and pepper. Place on a baking sheet and cook for 7-10 minutes, depending on thickness of fish. 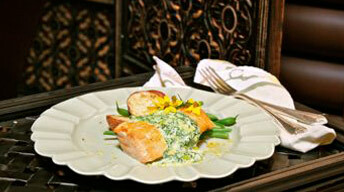 Remove from oven and serve with spinach-lemon cream sauce. Heat butter and 1 Tbsp of the olive oil in small saucepan over high heat. Add shallots; cook until translucent, about 5 minutes. Stir in Chardonnay; cook until liquid is reduced by ¾. Pour in cream; bring to a boil. Reduce heat to low and simmer until liquid is reduced by half. While the cream is reducing, heat a large saute pan over high heat. Add remaining 1 Tbsp of olive oil and spinach. Saute until spinach is completely wilted; remove from heat and cool slightly. Squeeze excess liquid from spinach and place in blender. Add reduced cream and zest; puree until smooth. Strain through a fine sieve and return to the saucepan. Season to taste with lemon juice, salt, and pepper.